Morgan Daimler’s book Where the Hawthorn Grows is an unusual entry in the growing marketplace of books about Celtic and Druidic spirituality, and I was very pleased to read it. While Ms. Daimler talks about being a modern Druid in North America and keeping ancient beliefs alive by bringing them into the modern age and allowing them to change to fit the current world, her main thrust is a reasoned effort at remaining true to the ideals of the ancient Celts as we know them through the texts and other historical sources that have come down to us. Following the threads of an ancient tapestry of spirituality and culture, she discerns the pattern the Druids wove centuries ago and exhibits it to us as a practical underpinning for modern pagan life.To begin with, Ms. Daimler clarifies her own stance as a reconstructionist and Druid, including a clear definition of reconstructionism since it’s so often misunderstood, so often the source of argument and dissent within the broader pagan community. Then, based on the ancient texts and historical sources, she shares a discussion of ethics and beliefs, an extensive description of Irish deities and a lovingly composed set of seasonal sabbats and rites of passage.Where the Hawthorn Grows is not the romance of Victorian neo-Druid fantasy but the reality of a spiritual and cultural tradition that can work well for modern pagans who want to connect with their Celtic cultural roots. This is not a beginner’s book; Ms. Daimler assumes familiarity with terms such as geasa and blot, so be prepared to look up anything that’s new to you. But for those who are interested in Celtic and Druidic paganism, it offers real substance and a comprehensive look at historically-based spirituality. Ms. Daimler provides references at the end of each section and an extensive reading list at the end of the book, which is helpful due to the heavy historical content of her text.All in all, Where the Hawthorn Grows covers a huge subject well, providing a great deal of information and real substance on which the Celtic-leaning modern pagan can easily build a personal spiritual practice. This is a personal journey through reconstruction Druidism drawing on ancient stories, beliefs and the heart and soul of druidry.Jam packed with interesting and unusual information and some interesting customs that I hadn't heard of before.It has a very interesting section on healing deities along with fascinating chapters on spirits of the land, ancestors, detailed celebrations, life passages (which you don't often see in books) and a section on folk magic, one on Seidr work, community and sacred tattooing which I was pleasantly surprised to find too.Whether you are a druid, witch, pagan or otherwise this is definitely an interesting book to have and one that I am sure you will read from cover to cover and re-read, I know I will! 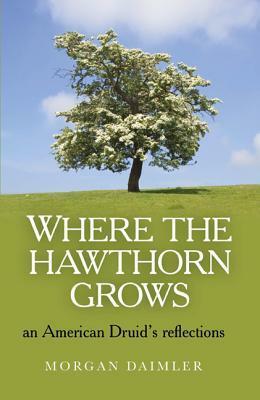 Morgan Daimler's Where the Hawthorn Grows is subtitled “An American Druid's Reflections” and that's exactly what it is. It sits well on the line between modern American culture and ancient Celtic culture. Daimler tries to channel as much authentic Celtic and Norse paganism into modern practice as she can without becoming bogged down in minutiae of historical reconstruction, foreign terminology, or any of the other pitfalls of reconstructionist paganism. As such a book, I suspect it has a large crossover appeal for both the general neopagan reader and the more historically minded “recon” reader. It also straddles the line between an objective study and a personal account, as Daimler often gives two entries for subjects such as the Celtic holidays; one section providing an objective definition and instances of its appearance in ancient sources, and a second section detailing her personal experiences. Frankly, I have often avoided crossing the line from neopaganism to the more historically minded reconstruction paths because they seem so sharply defined and with little middle ground to ease the transition from one to the other. Where the Hawthorn Grows seems to have filled this role rather well and left me with new things to consider and a new list of follow up reading to pursue. This was an interesting book, but it seemed uncertain whether it wanted to be a memoir or a primer on Reconstructionist Druidrism (Druidry?). Based on the title, I was actually hoping for more of a memoir experience. And to be be fair, there are sections of the book that fulfill that desire, but they're fewer in number than what I was hoping. The author did her homework and knows her stuff when it comes to explaining rituals, deities, and other aspects of this particular religious tradition. For a reader whose interest is purely intellectual curiosity, though, I found the chapters on specific ritual practices rather more lengthy than necessary for a book of this size.The final chapter on the pagan community was particularly interesting. I appreciated the author's candid perspective; to be honest, it was an interesting enough topic that I'd have loved an entire book focused on that.Final verdict: an interesting read but didn't quite fulfill my expectations. Morgan Daimler - My name is Morgan Daimler. I have been a witch since 1991, an Irish reconstructionist since about 1994, and heathen since 2006. I like to write poetry and recently ventured into writing fiction which I enjoy. I have had my poetry and prose published in different places including 7 anthologies, Circle magazine, Witches and Pagans magazine and the CR journal Air n-Aithesc. I am the author of the book By Land, Sea, and Sky, and the urban fantasy series Between the Worlds. Through Spero Publishing I have the children's book a Child's Eye View of the Fairy Faith.Through Moon Books I have Where the Hawthorn Grows, Fairy Witchcraft, and Pagan Portals: the Morrigan.